Full Game Story updated from Friday night brief. 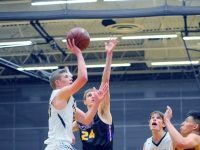 DENMARK – The deck couldn’t have been more stacked against the Denmark boys’ basketball team than it was on Friday night when it travelled to Freedom for its North Eastern Conference opener. On top of that, the Vikings weren’t even dealt a full hand. Playing without one of their top scorers and having to send another to the bench for the final nine minutes of the first half due to foul trouble, Denmark somehow managed to keep within arm’s length of an Irish team that finished fourth last year and returned virtually all its weapons. Making the task even tougher was the contrast of Denmark’s already thin bench with the endless stream of quality subs flowing in from the Freedom sidelines. 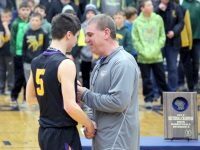 That Denmark actually had a couple of chances to take the lead a third of the way through the second half is a testament to their grit on Friday, but Freedom used a 15-1 run over a six-minute span to pull away for a 51-38 victory. After Suemnick, who opened the season with 29 points and 22 rebounds against Valders, went to the bench at the 8:41 mark of the first half, Freedom had the luxury of liberally subbing for their own starters, who at one point sat for several minutes and lost no ground. During a break in the action, all five starters rotated back in, while Denmark was subbing in players with almost no varsity experience. 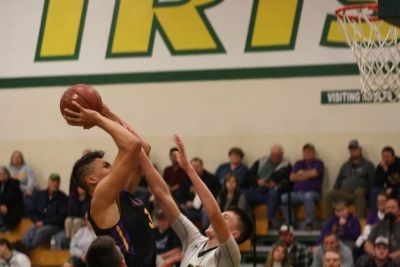 Freshman Donovan Short was able to keep the Vikings in it, knocking down a three-pointer and a free throw in the closing minutes and Denmark trailed only 22-15 at intermission. He and brother Zane Short accounted for all the team’s points after Zane scored the first five buckets and 11 points for the Vikings. 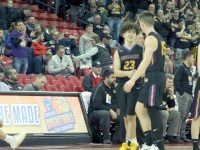 Sophomore Brennan Miller helped Denmark come out of the locker room with new energy, dishing out three quick assists in the opening two minutes, and Suemnick finally collected his first points of the game as Denmark closed to within 25-24. The Vikings might have been in command at that point were it not for their own chilly outside shooting combined with Freedom’s torrid pace from long range. Freedom hit its first five threes of the game and its first two of the second half – making 7 of 9 overall — while Denmark would finish the night just 4 of 20 from deep. Still, the last of those threes – from Jack Satori – and Zane Short’s putback had Denmark down 32-31 and with the ball with under 12 minutes remaining. After Suemnick matched a Freedom bucket with a layup, though, Freedom used its slashing style to score four straight baskets inside to open up a 42-33 lead. It was part of a 15-1 run that effectively put the game away. Denmark led only once – 2-0 on a Zane Short pull-up a minute in. But the Vikings went more than seven minutes without a point. Freedom didn’t score until five minutes had elapsed. Denmark had just four points better than 10 minutes in and trailed 13-4 before Zane Short collected three baskets in two minutes to keep Denmark in it. Short finished with 15 points, six rebounds and two assists, while Suemnick scored eight points – all in the second half. Satori added seven points, seven rebounds and two assists, while Donavan Short and Zachary Gezella each scored four. 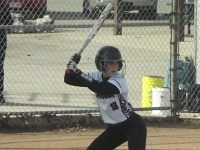 Gezella also snagged three steals. 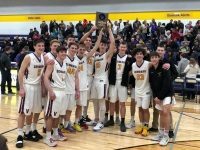 Miller didn’t score but had three assists and five rebounds and also played stellar defense, alternating between Devin Baumgart and Zachary Mashlan. Denmark made only 15 of 44 shots overall and was outrebounded 35-24. The Vikings also turned it over 16 times. Freedom knocked down 20 of 40 shots overall and turned it over 17 times. Mashlan led the way with 13 points. Stelmach said Jens will be evaluated on Monday. He hopes to have him back on Tuesday for a trip to Southern Door. If not then, the on Thursday when Denmark hosts Fox Valley Lutheran.